James got this pizza in Hatfield, England. He says the pizza wasn't that great. And they are sarcastic about the existence of an environment, apparently. Dammit I hate it when people are sarcastic about the environment! I mean come on! Let's be responsible adults here! 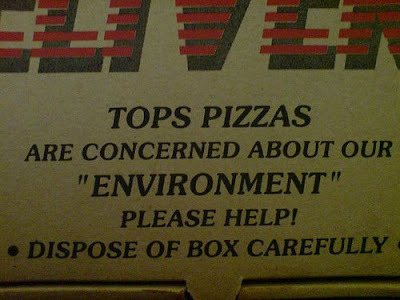 We all know what the cardboard pizza box does to the ozone layer!! Geesh!